Monograms are very popular these days. I’m seeing them in my sleep, I’m designing them so frequently. A few months ago a new client came to us for a custom monogram and wedding invitation package. I’m not going to post the one she chose because I want it to remain hers, you know what I mean? But here are some of the other options I designed for her that are similar to the one she chose. I want to share them with my readers because I think they’re a unique alternative to the regular three-letter-in-a-script-font variety. 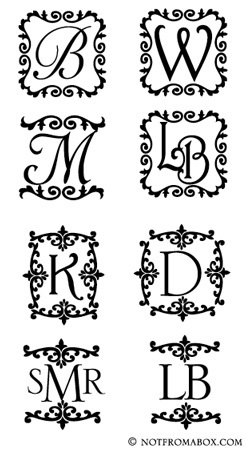 Notice that in some we only used single-letter initial (which would be the married last name) or the first initials of the bride and groom’s first name. In simple, block-style fonts. Another unique twist! This entry was posted on June 18, 2008 at 8:00 pm and is filed under Wedding Invitation Design Ideas. You can follow any responses to this entry through the RSS 2.0 feed. You can leave a response, or trackback from your own site.